A few weeks ago I laid this little brick transition area in a spot previously full of gravel and Bermuda grass. 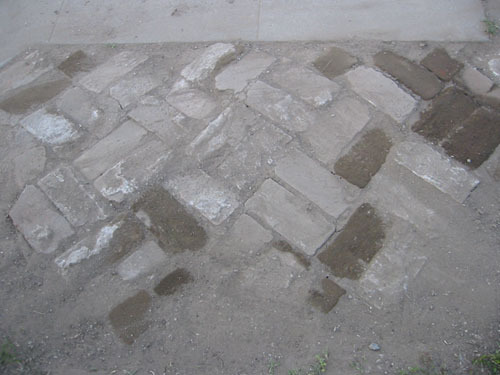 I've been flattering myself over my work ever since somebody who was passing by congratulated me on unearthing the original brick path. Hah! Over the last few weeks, I've been planting thyme in between the bricks, with hopes that it will spread and fill in the gaps. A few weeks ago it was wooly thyme, which has grown in very nicely (there is a leak in the drain pipe that runs under the path, so it gets regular water). This weekend, it was elfin thyme. Some weeds are re-invading, visible at the bottom of this photo, and I need to deal with them, but now I think it is ready to just sort of grow in for a summer. 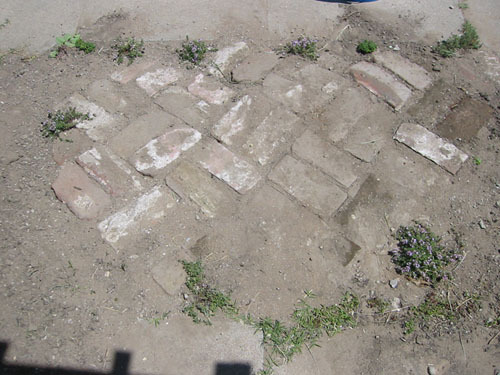 I've been working on a garden in east Alameda for 6 years now and I've found that wooly thyme does great- even in little gaps between bricks or stones- but elfin thyme never survives past a year or two no matter what I do.